As always, lots of things happened this week in the natural world around Hilton Pond Center, but due to yet another (and even more invasive) retinal surgery on the executive director, not many nature observations were made and recorded. Meanwhile, volunteers have been maintaining our all-important bird feeders, keeping them well-stocked with black sunflower seeds that are the favorite choice of many avian visitors to Hilton Pond. 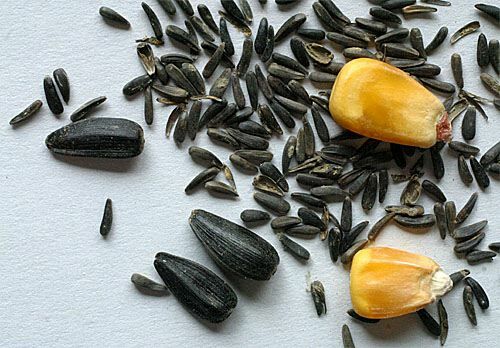 Thistle seeds are indeed tiny--scarcely a quarter-inch long by less than a sixteenth of an inch wide--and much smaller than a kernel of corn or a black sunflower seed (above). The alternate name of "niger" or "nyger" was used because at one time nearly all the seed was imported from Africa--although Ethiopia, rather than Nigeria, was the country of origin. The seeds are produced by Guizotia abyssinica (below right), which is not really a "thistle" (Carduus spp. or Cirsium spp.) but a composite more closely related to sunflowers. Thistles, by the way are also in the Sunflower Family--the Asteraceae (formerly Compositae)--but most botanists place them in a separate tribe (Cynareae) from typical sunflowers (Heliantheae). The niger plant has been cultivated for perhaps a thousand years in eastern Africa, India, China, and Myanmar (Burma)--primarily as an oil source for human consumption and, more recently, as food for cage and wild birds. Attempts to grow niger commercially in North America have largely met with failure, so shipping fees still lead to its relatively high cost; at least 70 million pounds are imported annually. An "EarlyBird" strain developed in Minnesota shows some promise as a domestic crop. 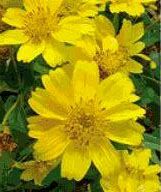 Niger is also grown in the U.S. in small quantities as an ornamental under the name "Ramtilla" and has escaped from cultivation in several states. 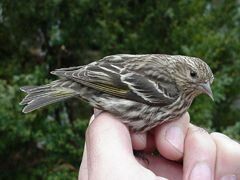 In past winters, thistle seed at Hilton Pond Center attracted impressive numbers of heavily streaked and pointy-billed Pine Siskins (below left), but this species has declined significantly at our feeders; the last one seen locally was on 17 April 2002--even though 486 siskins were banded in the winter of 1986-87. Back then they consumed thistle we offered primarily via special thin-slit tube feeders that dispensed seeds one at a time. Thistle retails at a dollar or more per pound, but it doesn't spoil in wet weather like most foods we offer wild birds, and few thistle seeds go uneaten at Hilton Pond Center. 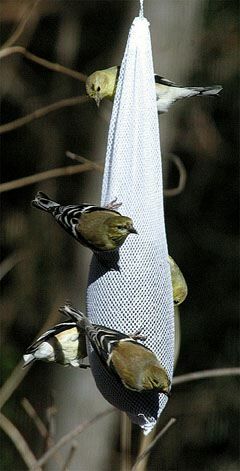 Thus, it's well worth the expense to pour a cup or two of thistle seed into a mesh sock that, across most of the U.S., is almost guaranteed to bring hungry American Goldfinches--or even elusive Pine Siskins--to your own backyard feeding station. NOTE: Be sure to scroll down for an account of all birds banded or recaptured during the week, as well as some other interesting nature notes. You may wish to consult our Index of all nature topics covered since February 2000. You can also use the on-line Search Engine at the bottom of this page. For a free, non-fattening, on-line subscription to "This Week at Hilton Pond," just send us an E-mail with SUBSCRIBE in the Subject line. Please be sure to configure your spam filter to accept E-mails from hiltonpond.org. Just CLICK on one of the logos below. --Due to retinal surgery on the resident master bander on the afternoon of 18 Jan, few birds were captured at Hilton Pond Center this "week" (actually, 15-18 Jan), and there were no recaptures. Banding is expected to re-commence at the end of the bander's initial recuperation period (on or about 30 Jan).